Panasonic made an interesting announcement last week – two new power zoom lenses for their G-Series Micro Four Thirds cameras. I believe these are the first compact system camera lenses with power zoom – usually that’s a point-and-shoot camera feature. The Panasonic LUMIX G X VARIO PZ 45-175mm/F4.0-5.6 ASPH./POWER O.I.S. and the LUMIX G X VARIO PZ 14-42mm/F3.5-5.6 ASPH./ POWER O.I.S. zoom lenses both offer powered zoom control via a zoom lever on the lens barrel. Both lenses are also, “Video and Still Optimized, ” meaning they have fast, silent auto focus and optical image stabilization. The PZ 14-42mm is a collapsible “pancake” lens and it’s only about 1-inch tall in its collapsed position. In the LUMIX G X VARIO PZ 14-42mm/F3.5-5.6 ASPH./ POWER O.I.S. zoom lens press release, Panasonic calls the new X-Series optics, “premium lenses.” Both lenses, “feature superb image rendering for lifelike textures, crisp edge-to-edge contrast, a unique Nano Surface Coating to help minimize ghosts and flaring in natural settings with remarkable transparency.” No doubt, some of you are reading this and wondering why you would want a power zoom lens. I don’t have a definitive answer to that question. But I’m betting that power zoom works great for smooth zooms in video clips. However, I can’t see any benefit for still photographers. Maybe someone else has some ideas? If so, please share them in the comments section below. 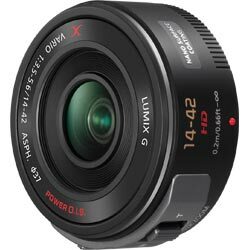 Both the new Panasonic X-Series power zoom lenses will be available this fall. There will also be a new Panasonic Lumix GF3X camera kit that pairs the GF3, Panasonic’s smallest and lightest Micro Four Thirds camera, with the new LUMIX G X VARIO PZ 14-42mm/F3.5-5.6 ASPH./ POWER O.I.S. pancake power zoom lens. The GF3X camera kit will be available in October and sell for about $750. 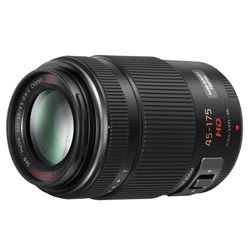 The new X-Series PZ 14-42mm zoom lens will be available alone for $399.99. The new Panasonic LUMIX G X VARIO PZ 45-175mm/F4.0-5.6 ASPH./POWER O.I.S. power zoom lens will be available this month (September) for $449.99.